The William M Thomas Planetarium will be upgrading its all-dome Spitz SciDome system over the next two to three weeks. The new system will have sixteen times the number of pixels on the dome for much sharper images. I’m looking forward to seeing what the ever-popular “Black Holes” show looks like with the new projection system. We’ll still have the Goto Chronos star projector to display a gorgeous night sky. Last week the Japanese Aerospace Exploration Agency’s (JAXA) Hayabusa2 mission to the small asteroid Ryugu had its first of hopefully several successful ways of exploring Ryugu with the deployment of two small “rovers” onto the surface. I put “rovers” in quotes because the two small craft will not roll across the surface on wheels but instead will hop about. The surface gravity of Ryugu is much too weak for wheeled transport to work. The hoppers are called MINERVA II-1ab for second "Micro-Nano Experimental Robot Vehicle for the Asteroid” project. (With a name that begins with “micro-nano”, you know that the scientists were stretching a bit to make the acronym work.) The first MINERVA rovers were part of the first Hayabusa mission that explored the asteroid Itokawa thirteen years ago. Those rovers never made it to the surface of Itokawa and were lost to space due to an error in measuring how far it was from the asteroid when it deployed the MINERVA rovers. No such problem this time! The MINERVA hoppers are cylindrical in shape and just 7 inches wide by 3 inches high with a mass of 2.4 pounds. A larger version of the MINERVA hoppers will be deployed next year. (It still carries the MINERVA label even though it is probably a “micro-micro” instead of a “micro-nano” because “mimerva” just doesn’t quite have a nice ring to it.) Later in October, a lander built by Germany and France will land on the surface. Also later in October will be Hayabusa’s primary mission: descent of the main craft to the surface to collect samples from the surface and return them to Earth. Later in 2019, Hayabusa will shoot a two-kilogram copper lump into Ruygu’s surface to make a crater and then collect samples from the inside of the new crater. The two sets of samples will be returned to Earth in 2020. For more exploration of the mission go to http://global.jaxa.jp/projects/sat/hayabusa2/ . A few weeks ago I received a call from a reporter to comment about a paper by Philip Metzger making the rounds in the popular media that said Pluto should be reclassified as a planet because one of the metrics for distinguishing planets from “dwarf planets” is not historically valid. The invalid metric says that the body must be the largest gravitational force in its orbit, so that it has “cleared” out its orbit in order to be called a “planet”. That metric is what got Pluto re-classified (not demoted, mind you) as a “dwarf planet”. Well, I’m not sure what is so newsworthy about the historical research on how the word “planet” has been used. We already knew that the orbit clearing metric was a late add-on to the definition of planet and that the metric had not been used in the past. Of course, the story is really about our emotional attachment to Pluto. Many feel Pluto was unfairly kicked out of the “planet club” by some underhanded shenanigans at the 2006 IAU meeting when the orbit clearing metric was added late in the process. I’m surprised Dan Brown (of “da Vinci Code” fame) hasn’t written a book about it. The orbit clearing metric is problematic for three reasons: 1) how much clearing of the orbit a true planet does is not defined; 2) it takes A LOT of observations over many years to see if the orbit has been truly cleared out; and 3) the metric cannot be used for exoplanets. What is more practical to use is an object’s diameter or its mass. A body above a certain size will have enough internal gravity to make itself round and also initiate active geology. Pluto certainly fits the bill—it has the second-most geologically diverse terrain in the solar system after Earth. Metzger and his co-authors, one of whom is Alan Stern (the head of the New Horizons mission to Pluto), are intellectually honest in accepting what a proper definition of “planet” would mean: over a hundred objects in our solar system would become a planet, including the large moons. I would hate to be the one who tells our school teachers and parents that their kids will now need to learn the names of not just eight planets but over a hundred. Venus has now disappeared from our evening sky and bright Jupiter is getting low in the west in the evening. Saturn is high in the south when twilight ends and Mars in the southeast is now dimmer than Jupiter. Saturn still offers a great view of its rings. 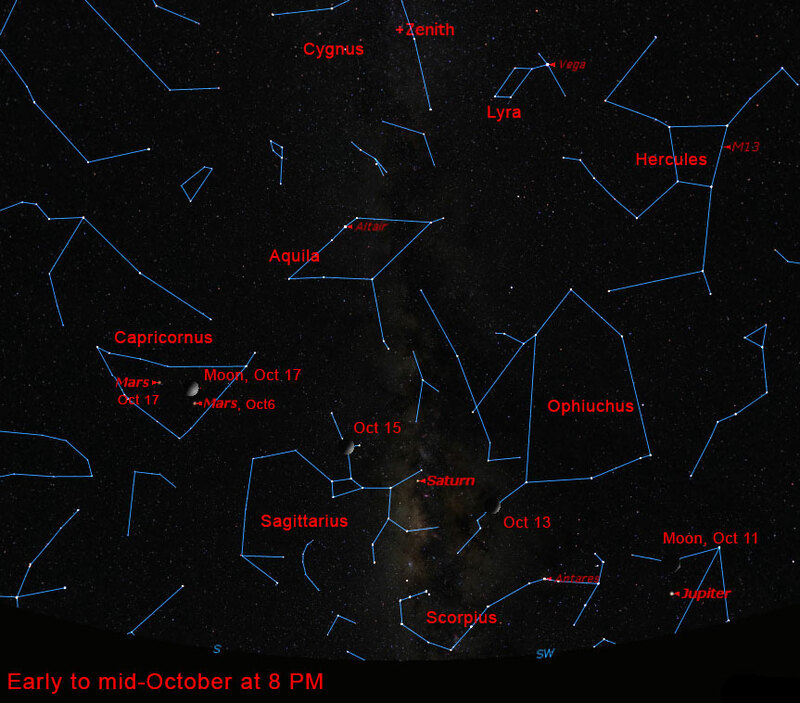 Check it out at the KAS public star party on Saturday, October 20 at Barnes & Noble. Before then look for the beautiful crescent moon as it moves by the planets over this week.